I thought I remembered what 48 degrees felt like. You guys, I was wrong. Hawaii has spoiled me forever. But let’s not talk about the weather Weather is boring. Let’s talk about staying awesome when the world is hinting that maybe you aren’t. Let’s talk about continuing to put your voice out into the world, even if you feel like no one is listening. Let’s talk about not giving up, even when it would make life much easier. Perseverance, kids. That’s how to be awesome. Then, let’s talk about cheesecake. Not everyone is a pumpkin fan. I don’t quite understand it, but I hear it’s true. There are plenty of other fall and winter flavors to celebrate with, though. Like maple. Sweet, sweet, golden maple. Just close your eyes and put yourself in a Vermont forest. What’s more winter than that? 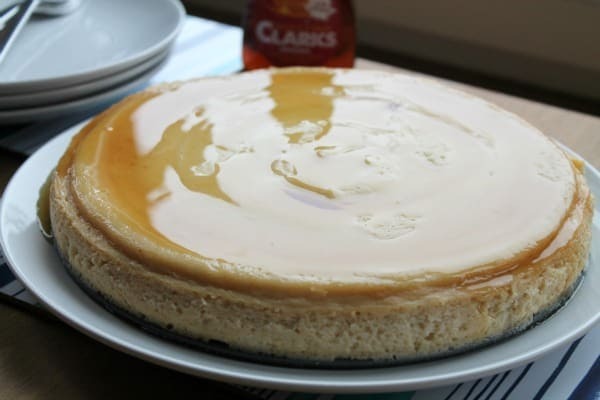 Maple Cheesecake is slicked with gleaming maple syrup, giving it a shine that makes it pretty enough for your holiday table. You may not believe me, but this cheesecake is actually not that sweet. It is, however, creamy dreamy good and quite simple to make. And it pretty much has to be made ahead of time, so there’s nothing to worry about while you’re getting dinner together. Don’t let anything get you down, and definitely don’t let anything get between you and Maple Cheesecake. Preheat oven to 350F (175C) and pull out your nine-inch springform pan. Stir together your crumbs, melted butter, and maple extract if you have it until the crumbs are moistened. Press this mixture evenly into the bottom of your springform pan and stash it in the fridge while you make your cheesecake batter. In a large mixing bowl, beat together cream cheese, sugar, cornstarch, and maple syrup until smooth. Add the eggs one at a time and beat until smooth after each one. Scrape down the side of your pan. Add in the lemon juice, and give it all one last mix. Put a kettle of water on to boil. Remove your pan from the fridge and wrap the outside in plastic wrap followed by a double layer of foil to keep out the water from the water bath you're about to create. Pour your cheesecake batter over your crust. Place the pan inside a roasting pan. Open the oven and pull out the middle rack. Place the roasting pan on the rack and carefully pour the recently boiled water from your kettle into the roasting pan until it comes halfway up the outside of your springform pan. 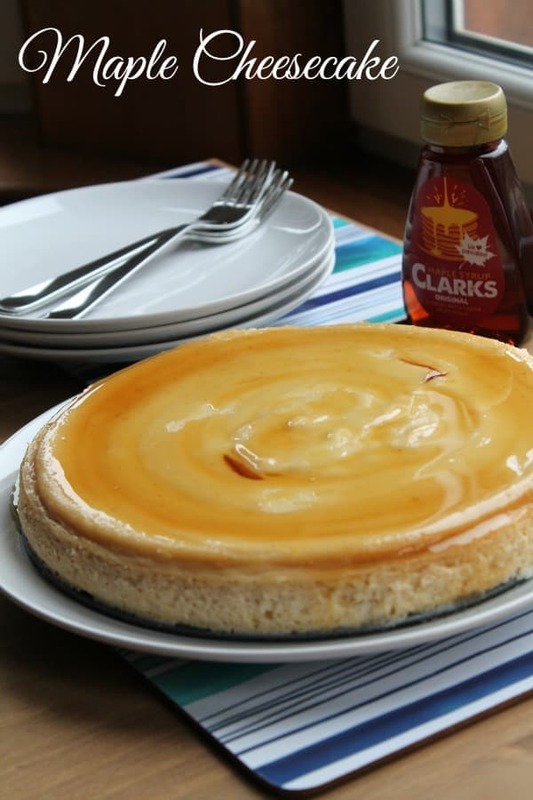 Bake for 1 hour and 15 minutes or until your cheesecake is barely wobbly. Turn off the oven, open the door, and let your cheesecake cool in the oven for at least an hour. Remove the cheesecake from the oven and the roasting pan. 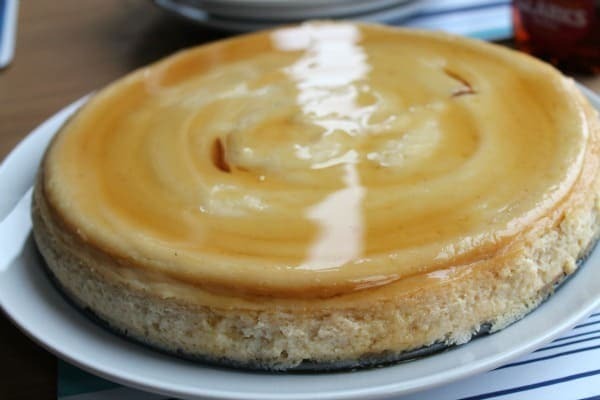 Peal back the foil, and allow your cheesecake to cool on the counter until it comes to room temperature. Move your cheesecake to the fridge to chill for at least 8 hours. When you're ready to serve, remove the collar from your springform pan and place your cheesecake onto a plate or pretty platter or cake stand. Generally pour maple syrup over the top to create a shiny shallow lake of sweetness. Slice and serve and smile.